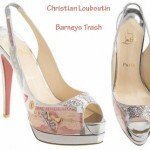 How About Christian Louboutin’s Trash Shoes? 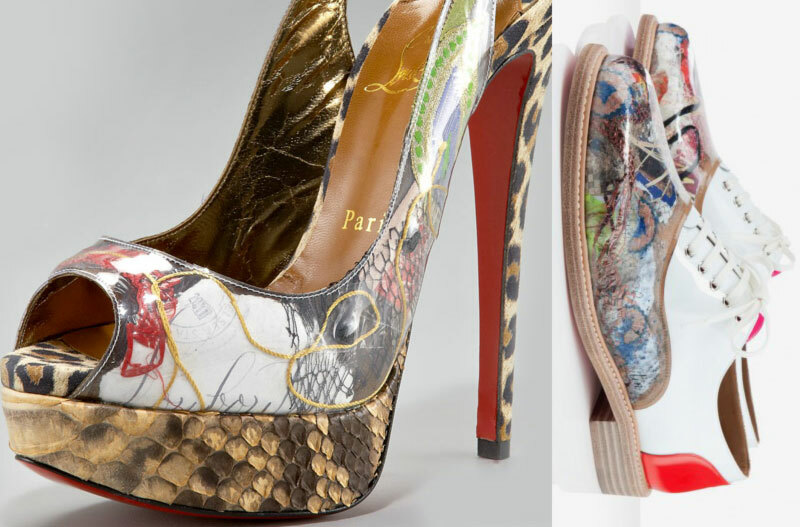 But did you know that the unique shoes from the ‘Trash’ series, in addition to python skin and/or more precious materials, they were actually made of trash found around Louboutin’s atelier? Leftover sequins and fabric, postage stamps and thread? Sure, it’s a walking contradiction as trash, conscious and python skin sound like a match made in the hot depths of style hell, but as long as they’re red-soled, they’ll get by with their 4-figure price tag. Actually the shoes were so successful, a men line was created in 2012, with a similar tag (around $900 – the heel reduction in this case comes with a price reduction as well?) and produced also by piling up a good amount of trash, pressing it, waving the Louboutin wand and sculpting yet another trash-y bestseller! 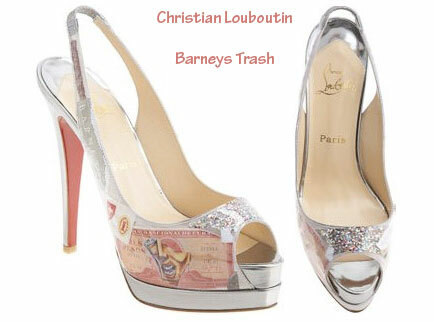 See also: Who’s wearing Louboutin’s Trash shoes! I like them, they are trashtastic! 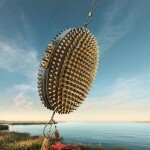 Are they working the eco-conscious angle on these outrageously-priced shoes, perchance? Sal, I do often agree with your remarks! 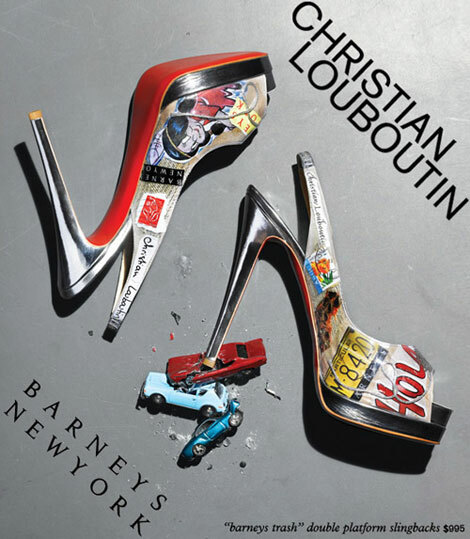 I dont care if they’re Louboutins – they look quite cheap and unsophisticated. they’re totally aristic and hot! does anyone know the photographer for this series? I quite love them, just because they are so 90s and straight out of the costume department from (the original) Absolutely Fabulous! They remind me of 90s bad taste Moschino, Lacroix, Gaultier.. (the ones in the ad at least – the ones in the second pic are a bit more tasteful). they’re fabulous. I MUST HAVE THEM! costume department from (the original) Absolutely Fabulous! They remind me of 90s bad taste Moschino, Lacroix, Gaultier.. (the ones in the ad at least – the ones in the second pic are a bit more tasteful). 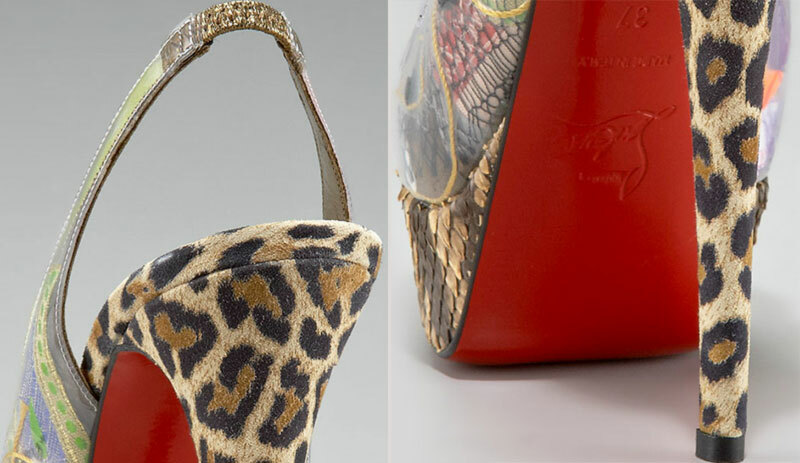 I think Louboutin has some of the worst shoe designs on the planet. While some are beautiful (though still no where worth the price), most are not worth the price of the materials used to make them!